Fabulous food, family-friendly service and now dinner with wine too, Grazie Mille is a little haven of Italy in Carshalton. No wonder it's such a big hit with local mums! As beautiful as Carshalton Village is, what it lacked for many years was a really good, family-friendly coffee shop and restaurant. Somewhere where you can pop in for a quality coffee, brunch with other mums or a relaxed evening meal over a glass of wine with family or friends. Finally our prayers were answered with Grazie Mille. 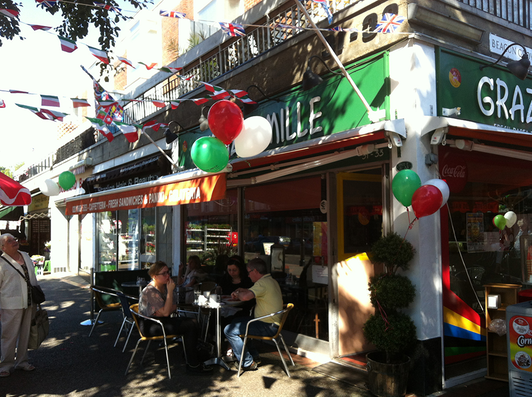 Opening in 2006 in the heart of Carshalton Village,�Grazie Mille has carved out a niche for itself as the number one spot to enjoy great food, coffee or a drink and family-friendly service. Owner Claudio is delighted with his coffee shop and restaurant's success and popularity with local mums. "We strive to make everyone feel welcome, especially mums with kids," says Claudio, whose children attend St Mary's Juniors and Infants in Carshalton and whose third baby, Lorenzo, was born last year. "We pride ourselves on our friendly service and try and make everyone feel relaxed and enjoy their time with us." Claudio has recently refurbished the coffee shop and restaurant with a new toilet and baby-changing facility at the rear, making �Grazie Mille�even more family-friendly. "We have listened to what our customers wanted and upgraded the cafe accordingly," explains Claudio. Specialities of the house are homemade meatballs, lamb shank, salsiccia picante (spicy sausage pasta), stuffed aubergines and soup of the day, with lots more daily specials for lunch and dinner. For the sweet toothed you can sample the delicious freshly made tiramisu and Italian mini patisserie, filled with hazelnut or vanilla cream. "We offer a wide selection of British and Italian cuisine, all freshly prepared by our new chef Aldo," explains Claudio. "We use both local produce (supplied by new greengrocers Rhubarb and Bramley nextdoor) and some specialities imported directly from Italy. We constantly change our menu to suit fresh, seasonable produce. We can cater for your business meetings, breakfast, lunch and dinner, couples, families or large groups. Or just pop in and enjoy a cappuccino and a chat with friends in a pleasant atmosphere." 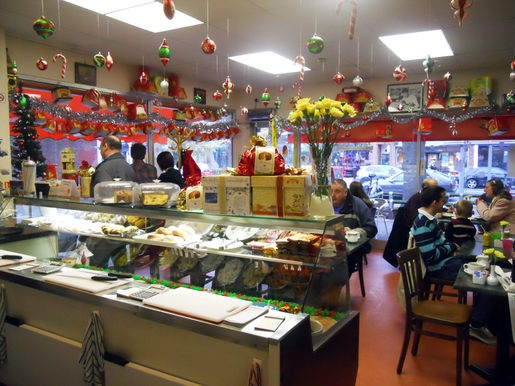 "I pride myself on offering a little piece of Italy in the UK," adds Claudio. "I am delighted to be able to offer my customers the best of Italian cuisine while not ignoring their desire for more English-style food too!" As well as good coffee and great food, delicatessen items are sold from the Grazie Mille shop.�And from 29th April 2013 this fab family-friendly coffee shop and restaurant will be taking last orders for dinner at 9pm every evening (4pm on Sundays). As the sun goes down, tables will be covered with traditional Italian red-and-white gingham table-cloths and wine will be served in italian rustic-style tumblers. It really does feel like a corner of Carshalton is becoming truly European! "This is the way we do it in Italy," says Claudio. "No fancy silver service or expensive wine glasses, just fresh, quality, affordable dishes served in a relaxed way, with the drink of your choice if you feel like it!" Much to local mums' delight, Claudio recently applied for a license to allow his clients to bring their own alcohol, cutting down on the cost of a local night out. "This is perfect for groups of mums to have an affordable night out and still have great food," said Local Mum Sarah Peters. "I'm looking forward to going their with my book club for chats over pizza, pasta, calimari and, of course, wine!"